6,000 Adoptions Reached at PetFinder.my! 6,000 PET ADOPTIONS reached at PetFinder.my! We're well on our way to reach almost 3,000 adoptions within our 3rd year. Great job and well done to all the rescuers and animal lovers! Re: 6,000 Adoptions Reached at PetFinder.my! when I join here was zero, after 3 year became 6000. well done to everyone. Yup, time flies, and so many changes and developments have taken place since then. Thank you for your kind support from the early days till now, Clement! Let's all continue to work hard, and maybe we might reach 5-digit total adoptions by end of next year! 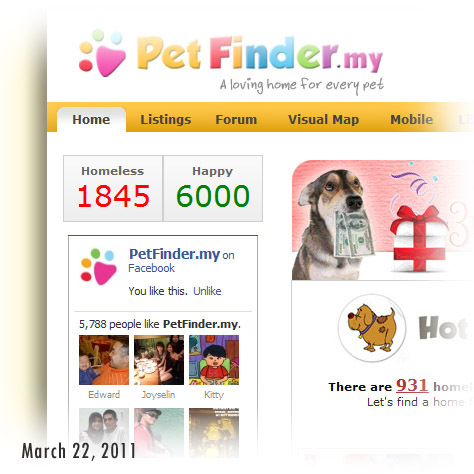 Congratulations to all Petfinder.my members & admin!! !